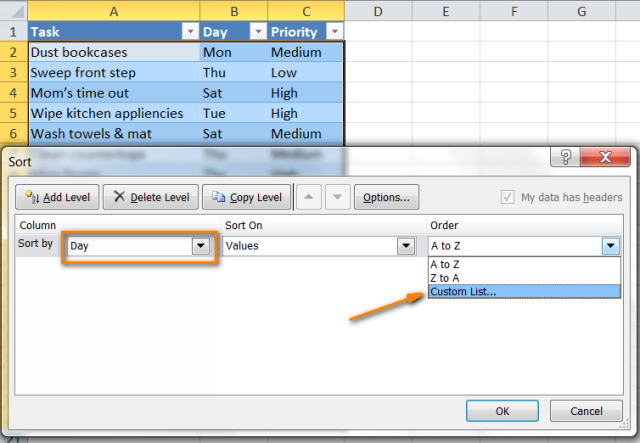 In this article I will show you how to sort Excel data by several columns, by column names in alphabetical order and by values in any row. Also, you will learn how to sort data in non-standard ways, when sorting alphabetically or numerically does not work. Click the Sort button on the Data tab or Custom Sort on the Home tab to open the Sort dialog. Firstly, the Region column is sorted first, in the alphabetic order. 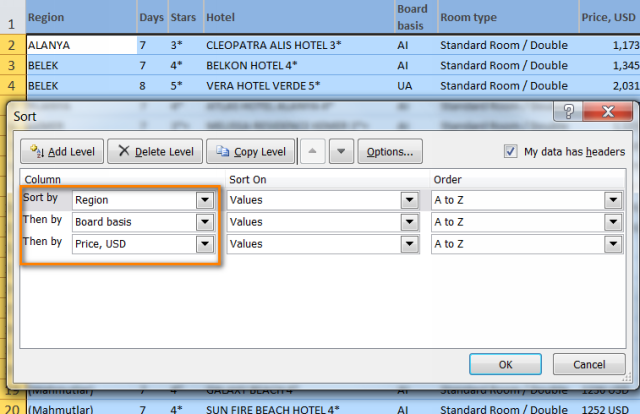 Secondly, the Board basis column is sorted, so that all-inclusive (AL) hotels are at the top of the list. Finally, the Price column is sorted, from smallest to largest. 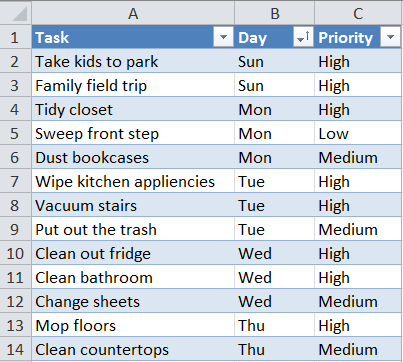 Sorting data by multiple columns in Excel is pretty easy, isn't it? However, the Sort dialog has plenty more features. Further on in this article I will show you how to sort by row, not column, and how to re-arrange data in your worksheet alphabetically based on column names. Also, you will learn how to sort your Excel data in non-standard ways, when sorting in alphabetical or numerical order does not work. I guess in 90% of cases when you are sorting data in Excel, you sort by values in one or several columns. However, sometimes we have non-trivial data sets and we do need to sort by row (horizontally), i.e. rearrange the order of columns from left to right based on column headers or values in a particular row. What you need is to sort the photo cameras by some parameters that matter the most for you. As an example, let's sort them by model name first. Click the Sort button on the Data tab to open the Sort dialog. Notice the "My data has headers" checkbox in the upper-right part of the dialog, you should uncheck it if your worksheet does not have headers. Since our sheet has headers, we leave the tick and click the Options button. 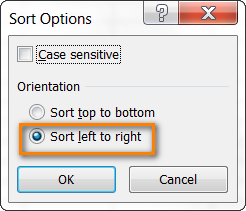 In the opening Sort Options dialog under Orientation, choose Sort left to right, and click OK.
Then select the row by which you want to sort. In our example, we select Row 1 that contains the photo camera names. 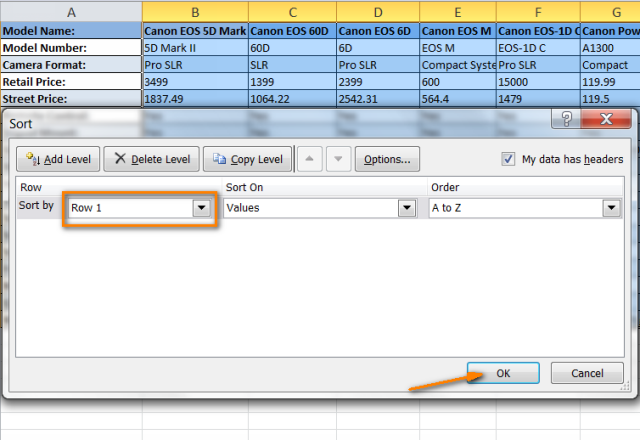 Make sure you have "Values" selected under Sort on and "A to Z" under Order, then click OK. I know that sorting by column names has very little practical sense in our case and we did it for demonstration purposes only so that you can get a feel of how it works. In a similar way, you can sort the list of cameras by size, or imaging sensor, or sensor type, or any other feature that is most critical for you. For instance, let's sort them by price for a start. Please note that it's not just one row that has been sorted. The entire columns were moved so that the data was not distorted. In other words, what you see in the screenshot above is the list of photo cameras sorted from cheapest to most expensive. 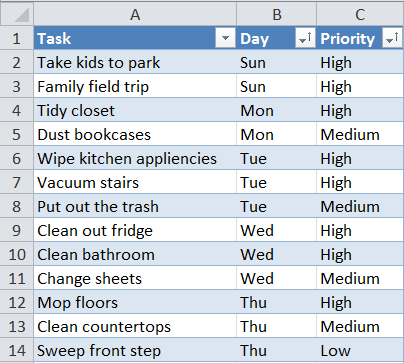 Hope now you've gained an insight into how sorting a row works in Excel. But what if we have data that does not sort well alphabetically or numerically? Say, we have a list of weekly household chores and we want to sort them by due day or priority. You start with selecting the data you want to sort and then opening the Sort dialog exactly like we did when sorting by multiple columns or by column names (Data tab > Sort button). 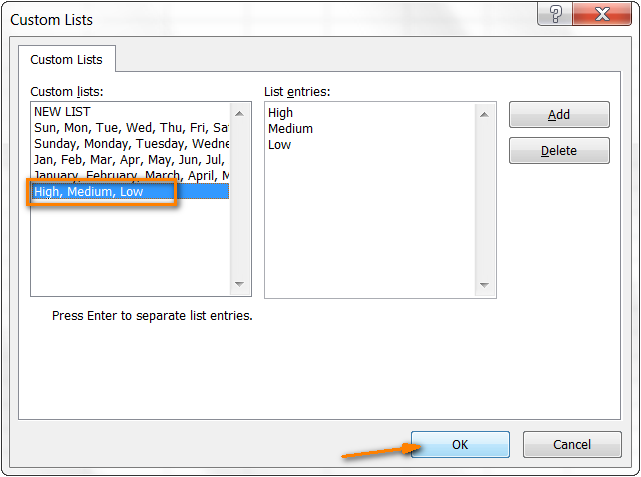 In the Custom Lists dialog box, select the needed list. 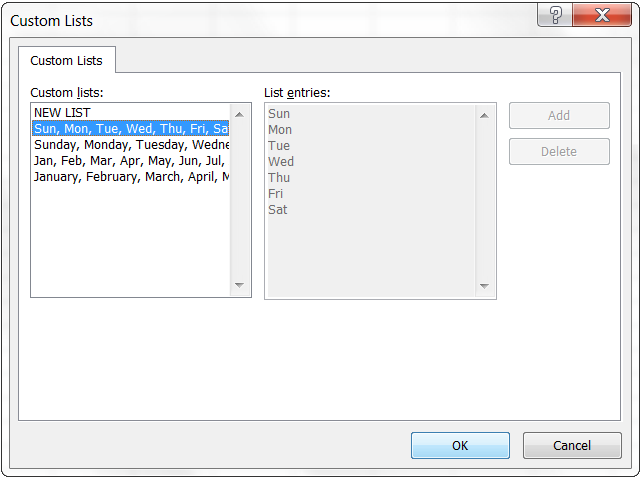 Since we have the abbreviated day names in the Day columns, we choose the corresponding custom list and click OK.
Well, as you see sorting Excel data by custom list does not present any challenge either. The last thing that is left for us to do is to sort data by our own custom list. As you remember, we have one more column in the table, the Priority column. In order to sort your weekly chores from most important to less important, you proceed as follows. Tip. 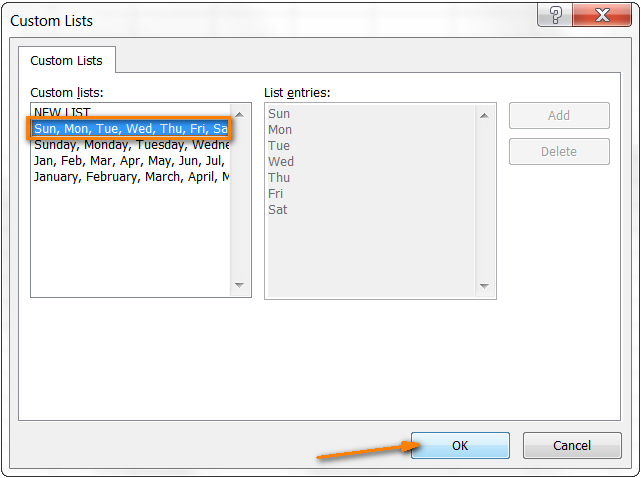 For long custom lists it may be faster and more convenient to import them from an existing workbook, as explained in this article Creating a custom list from an existing worksheet. 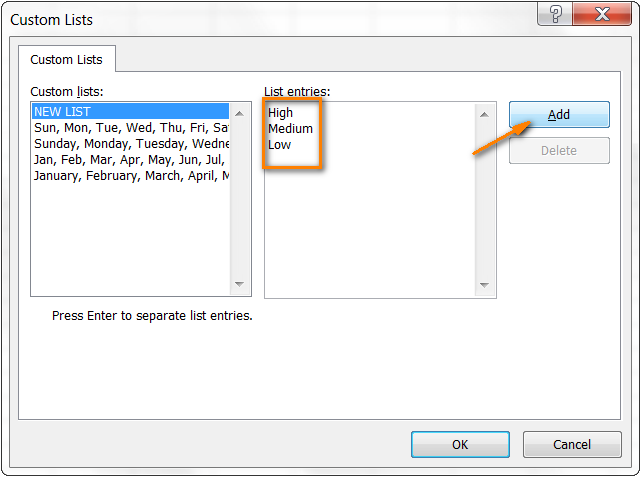 When you use custom lists for sorting, you are free to sort by multiple columns and use a different custom list in each case. The process is exactly the same as we have already discussed when sorting by several columns. 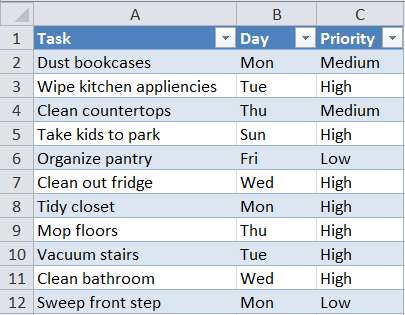 21 Responses to "How to sort in Excel by row, column names and in custom order"
I have an Excel spreadsheet I created to keep track of data for my job. The first column of the spreadsheet captures individual files I am working on, and each other column captures some piece of information important to that file. The first row contains the column headers. What I would like to be able to do is to make it so that if one clicks on the column header, it's sorts the column data, while also rearranging the rows themselves so that the data in the column stays in sync with the data contained in the row that it was in. I hope that wasn't too wordy. Any help would be appreciated! What I would like to be able to do is to make it so that if I sort the 1st column, it sorts the column data, while also rearranging the rows themselves so that the data in the column stays in sync with the data contained in the row that it was in. hi, good day! i'm having trouble in sorting my employee masterlist. i'd like to sort it from a to z, the trouble is there were columns with employee's information. how can i sort it together with the employee's information/details. thank you. How about sorting at the end of entering a new record? meaning, when I enter new information, moving from left to right using the tab key and pressing enter when finished with all the entries in that row. I have a spreadsheet with student information which is organized alphabetically by last name then by first (there are filters). 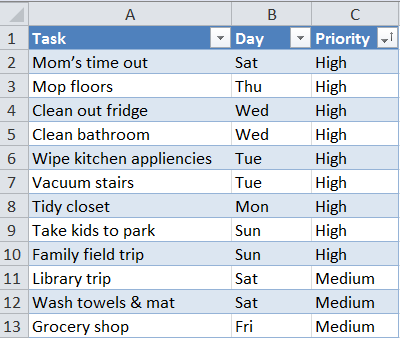 Rather than sort the list again each time I make an edit (like change someone's last name when they get married)or add a new student, I’d like excel to automatically alphabetize the record(s) when I hit enter at the end of the entry. I learned how to do this a LONG time ago when working on my assoc. degree but can’t remember how and haven’t been able to find exactly this in the help files or online. I have converted PDF to excel having large data. The problem I m facing is all the data is under one column only. I have reaarange the data in different columns like Ac no, Client name and Ben. How ever I am unable to link the doc types with the Ben name as they get mismatch on large numbers.please help how can I do that do all doc types matches with Beneficiaries. This is the problem I am having : a 3 column list of product dimensions that I need sorted from largest to smallest by data per row. Column A is Length, Column B is Width, and Column C is Height. The length of the product must be the largest measurement, width next, height smallest. I cannot seem to find a way to sort this on a multiple row scale. i would to create custom list consist of more than 40 item , while the list entry accommodate only for 29 item. i'm using Excel 2010. How to Put formula in excel to display date wise all data Like this by searching name? I have created a list four columns wide. Just so the fit on one page. I want to alphabetically sort them a-z. how do I do that? The simplest way to sort your column is to click A-Z button either under the Home tab, Editing group or on the Data tab, Sort & Filter group. To sort you data A-Z by several columns, please take a look at the detailed tutorial at this section of the article. I have data in Column A & B like below sample 1. And I want to make a list of all payment date under specific ID like sample 2. Pls advice how can I do it. I have a list of over 200 paint colors. The colors are in columns A,B,C, & D. I would like to sort all (not each) of these columns in alphabetical order with A1 being Apple Red & D40 being Zinc. So basically, the columns are "wrapped". Can I sort these four columns?